Sony is offering a firmware upgrade program for Interchangeable Lens Digital Camera SLT-A99. In addition to the existing HDMI simultaneous output during movie recording, the camera will be able to display smooth smooth 60fps(NTSC)/50fps(PAL) video on an external monitor connected via HDMI and on the LCD screen of the camera simultaneously also during movie recording standby. Note: The camera needs to be in Movie mode with [HDMI Info. Display] set to [Off]. The applicable products are with the firmware Version 1.01 or earlier.. The firmware version is displayed. If your camera firmware version is already Version 1.02, this update is not necessary. Note: Please close all other application software before upgrading the firmware. Fully charged rechargeable battery pack NP-FM500H or AC adaptor AC-PW10AM (sold separately). Note: The upgrade can be performed only when the remaining battery level is (three marks) or more. We recommend that you use a fully charged battery or the AC adaptor AC-PW10AM (sold separately). When performing the firmware upgrade, please use a fully charged rechargeable battery pack NP-FM500H or the AC adaptor AC-PW10AM (sold separately). Do not cover Eyepiece sensors during the update; otherwise, the LCD monitor may switch to the Viewfinder. If you can not see anything on the LCD monitor, please press FINDER/LCD button. Click on Update_SLTA99V102.exe to begin download. Please save the downloaded file onto the Desktop of your computer (recommended). Under the initial settings of Internet Explorer, the update file will be saved in the Downloads folder. Click the Desktop tile from the Start screen and find the downloaded file in the Downloads folder by using Explorer. Double-click the downloaded file Update_SLTA99V102.exe. Check the USB connection mode. 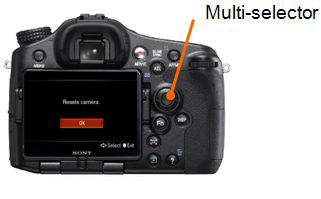 According to the instruction on Firmware Updater, select Menu → Setup → USB Connection on the camera, and confirm Mass Storage is selected. 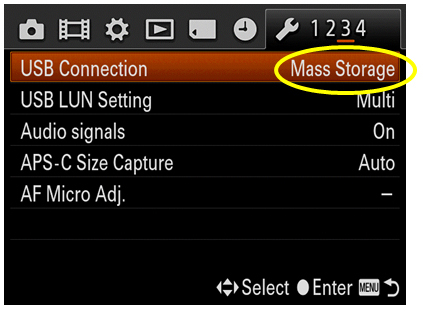 If the mode other than Mass Storage is selected, please select Mass Storage. USB Mode appears on the LCD monitor of the camera. If the computer cannot find the camera, the message Could not find the camera for this update. appears on the computer display. Try the following if this happens. - Disconnect the USB cable and connect it again. 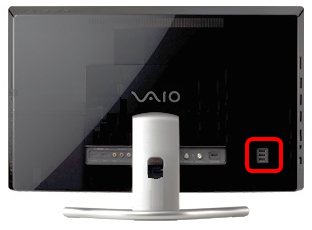 - If the computer has multiple USB terminals, try with the other terminals. Sometimes when the camera is connected to the computer with the USB cable, the message to encourage rebooting the computer may appear on the computer display. In this case, remove the battery pack or AC adaptor from the camera, reboot the computer, and follow the procedures from Start up Firmware Updater. After confirming the above, click Next on Firmware Updater. This screen appears on the LCD screen of the camera. After confirming the screens on Firmware Updater and LCD screen, click Next. 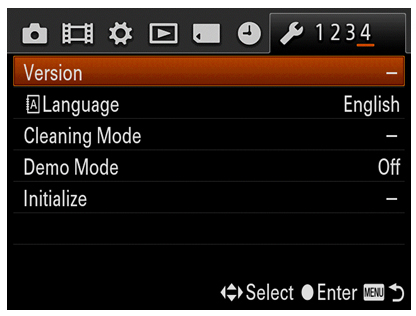 The current version and the version after the upgrade appear on the lower left part of the Firmware Updater. Note: If the screen below appears, the upgrade is not required. According to the message, stop the USB connection and click Finish. Turn off the camera, remove the battery pack or the AC adaptor, and then turn on the camera again. Note: Please keep the USB cable connected even after stopping the USB connection on the computer with the above operation. Press the center of the multi-selector (the control button) to execute. 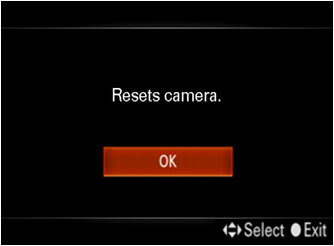 After resetting, reconnection of the camera is verified. Click Run to start the upgrade. The progress bar appears while upgrading (approximately 10 minutes). When the upgrade is completed, click Finish and disconnect the USB cable. Follow the instruction below to confirm the firmware version. The firmware version is displayed. The firmware upgrade was completed successfully if Ver.1.02 is displayed.